Curiosity got the best of me the other day. I wanted to know what happens to the material when our recycling partner, Pioneer Industries, picks up from Visual Impressions and hauls it away. Pioneer has been an integral part of our sustainability program for over a year now. It was difficult getting a recycler to help with our program, as even though we are a large apparel decorator, we are small potatoes in the manufacturing sense in Milwaukee. It was all a volume deal. That was before I met Marty Oxman with Pioneer Industries. A second generation recycler, the guy is an encyclopedia of knowledge regarding secondary materials, and is extremely keen on helping companies achieve their sustainability goals through recycling. My goal was to get a recycling program off the ground, and make it easy for our staff to do the work. The idea was to move as much material we could through a recycling program, and have it not go to landfill via our dumpsters. Pioneer helps us with that task, as they provide, for free, large bins called gaylords that we fill with different materials. We have these all over the shop, segregated by the material and within a few easy steps for our staff. They also give us the big 90 gallon totes with wheels that are commonly used for your trash pick-up at your home, which we put to good use as well. The gaylords have a decent size to them, and there are two kinds. One is a made from heavy duty plastic, and comes with a lid that can be placed on the box for closing. Then these become stackable. We’ve found that we like to use them for our polybag remnants and assorted mixed paper. We polybag our folded shirts for our clients, so they can be handed out easily or presented nicely to their customers. The remnants are from the automatic machine that closes and heat seals the bag, and produces a small 2” x 8” scrap of clear plastic. As we have four of these machines churning out product all day, we generate a lot of these little plastic scraps. The mixed paper is all the general paper that you would think a busy operation like Visual Impressions would generate. Any type of paper can be segregated into this bin. Some good examples that a lot of people just throw away is the waxy backing from shipping labels from your Zebra printer, or the tissue paper insert that comes layered inside button-down shirts that you have to remove before you can start the embroidery. The other type of gaylord is a little larger and is made from thick cardboard. 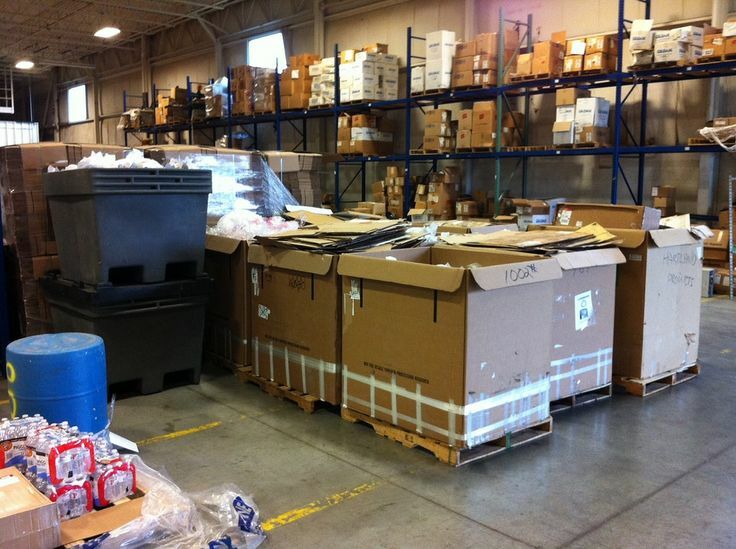 In these cardboard bins, we disassemble and place all of our scrap cardboard. We try to reuse boxes when we can, but a good number of these get bent, torn or arrive to us in pretty bad shape. 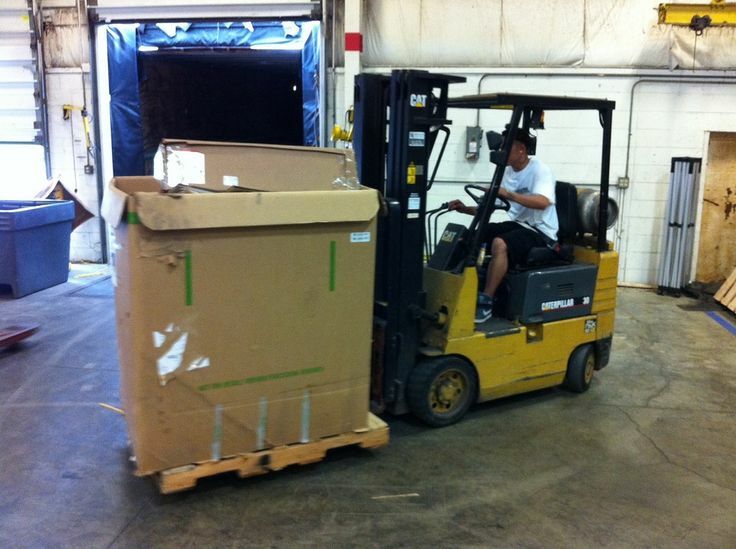 Some clients prefer to ship their orders out in their own boxes too. 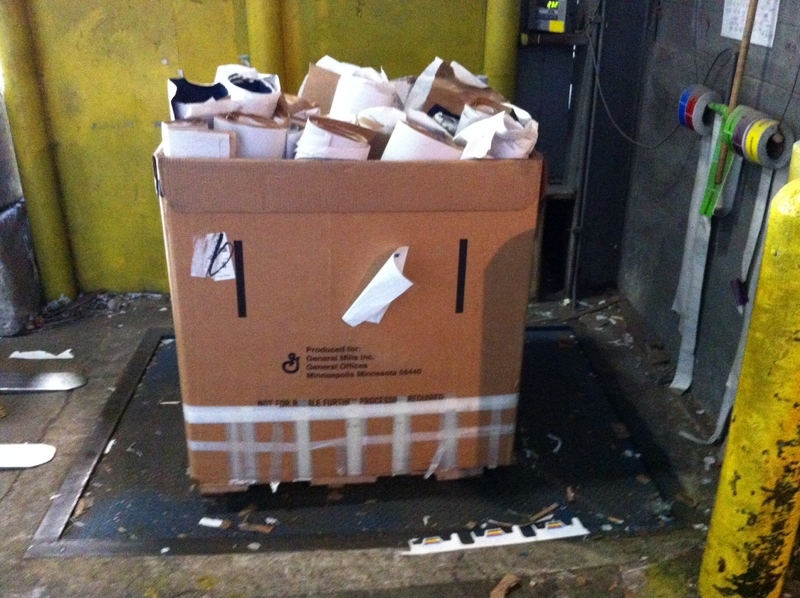 Any cardboard such as collar stays from polos or dress shirts, dividers, or inserts gets chucked into this bin as well. Despite reusing boxes constantly for shipments, it is still amazing how quickly these cardboard gaylords fill up. The 90 gallon totes are used for recycling smaller items such as aluminum soda cans, plastic bottles and strapping, glass, metal shipping banding, wickets and small parts. We have these judiciously placed all over the shop, near where the material is usually generated, but out of the way enough that people can still work. These totes take longer to fill, but using them is an easier way to divide up the materials, and makes it more convenient for our staff to do the right thing when the big gaylord is too large to fit into a work area. Knowing all this you can see why I might be curious as to what happens to all this stuff after the truck pulls away each Wednesday. Marty graciously accepted my “invite myself over” tour, and provided an excellent overview of his operation. So, when his friendly driver Jim backed the semi-truck into one of our shipping docks and our crew loaded up our materials, I pulled my car around and followed him back to Pioneer. The first surprise was that it was only about five miles away. Nestled between an aging old Milwaukee neighborhood and a spaghetti maze of train tracks, Pioneer Industries occupies several large, rambling buildings. I pulled in and parked, and as I was doing that the truck was slowly gliding onto a large truck scale. Marty told me later that this is one method on how they verify the weights for the material for each load. 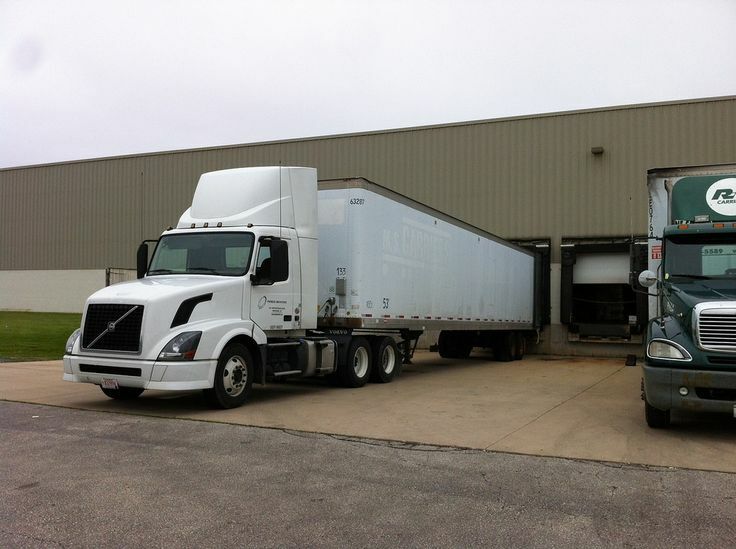 All of the material that is unloaded is weighed individually on smaller scales in the building so they can send us a documented report after each pick-up, but weighing the truck when it comes in ensures that it all adds up correctly later. 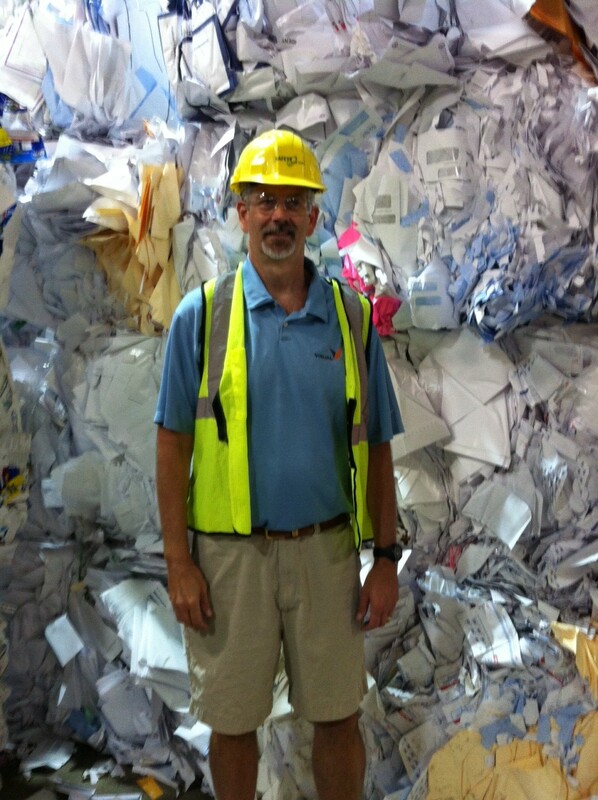 This is how we know exactly how much of each material type we’ve sent in for processing. After I parked, I walked around the building and found the front door. I was buzzed in, and Marty greeted me and issued me my PPE (Personal Protective Equipment) – hard hat, brightly colored ANSI safety vest, and eye protection. Walking through the rabbit-warren like maze inside the Pioneer buildings, I was impressed on how many different types of material they actually handle. 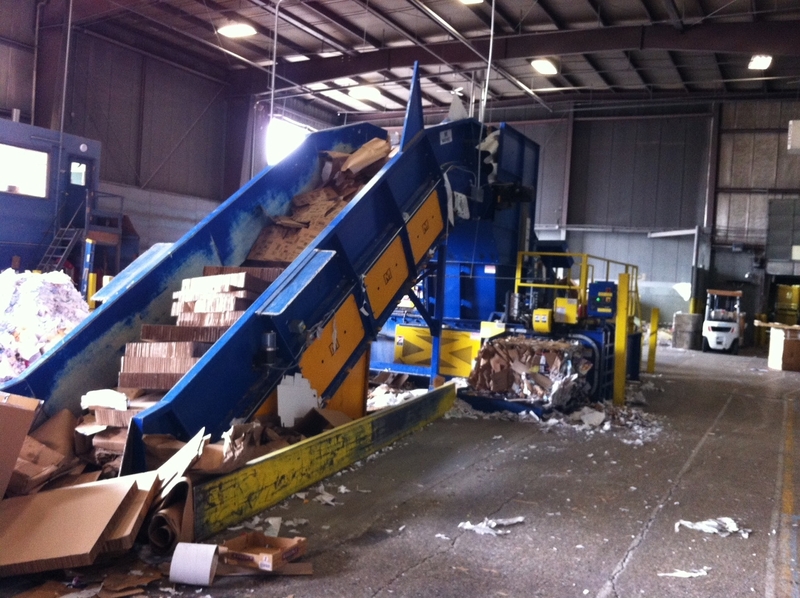 If you didn’t know, Milwaukee is one of the largest printing industry communities in the country, and Pioneer handles a lot of their scrap paper, cardboard and other printed waste that is discarded after the manufacturing process. 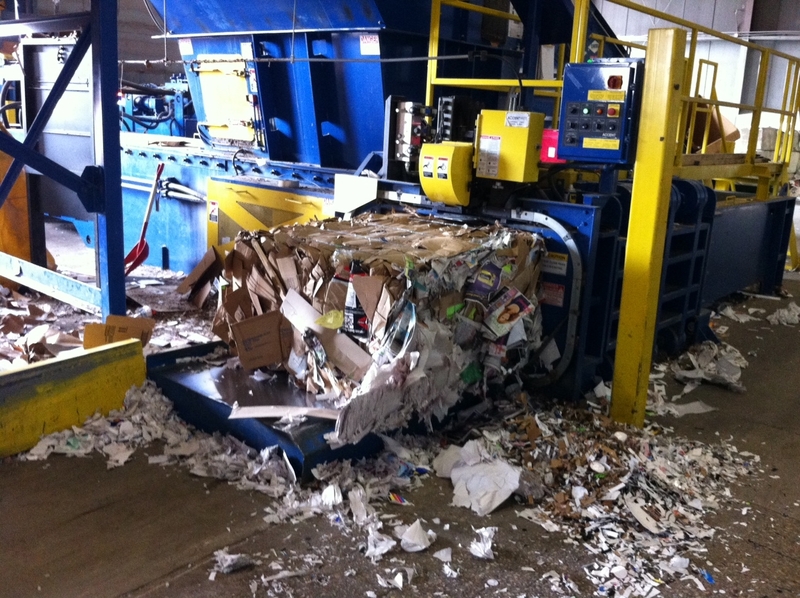 Each of these different types of printed material scraps are baled, banded and segregated by type into huge stacks of material. Once they reach a full trailer load, these are shipped out for processing to become new sheets of paper, cardboard, plastic or other material. Pioneer has a staff of fourteen people, and they were all busy working while we toured. Numerous forklifts and bobcat tractors were nimbly moving material around and into balers. Other staff were checking in materials and grading them, or getting a shipment loaded so it reach its final destination and be recycled. Lots of clipboards, finger and arm gestures and really heavy stuff being moved around with coordinated effort. It’s a ballet really, just without music. Based on my observation, paper and cardboard is the majority substrate that they handle, which is segregated by type as the material comes arrives. In one large area they have cordoned off a bunch of different bays made with large, heavy concrete blocks. Each bay is about the width of a small garage, and contains a large pile of a different type of paper or cardboard. From flimsy loose newsprint that is obtained from our Milwaukee newspaper, to thicker printed cardboard scraps that comes from local printing houses, all of the material is piled up like leaves in your front yard in the fall. Once the pile gets large enough, it is scooped up with the tractors and placed on an enormous conveyor belt that feeds a 20 foot high baler. The belt is about six feet wide at least, and an amazing amount of material travels up the belt and into the hopper bin at one time. The baler squeezes out the compressed material into bales about as big as your couch, but square in shape, and I couldn’t help but think that it resembled a gargantuan Play-doh pumper set that I had when I was a kid. They stack the bales by type of material in another huge room, and just patiently wait for the collection to grow until it reaches the point it can fill a semi-truck trailer. It is then shipped off. Some material is easily processed, as it is very common and there is a known pipeline. Other material, such as paper that has foil or adhesive on it, is harder to find an avenue for processing. Eventually it all goes somewhere though. It was surprising to me that some recycled materials actually go overseas, not processed domestically. Marty showed me a gigantic wall of spice-bags. These bales were made of former industrial sized bags of food spices. Heavy thick brown paper on the outside, but lined with a plastic bag on the inside. Separating the two materials isn’t something that is handled anywhere but China. Once they get enough to fill the truck, these get shipped off to join many others and will go overseas for processing. Evidently over there the labor is cheap enough that these are pulled apart by hand for recycling. The paper goes in one direction, the plastic in another. As I was driving back to my office at Visual Impressions, I reflected back on my time spent at Pioneer Industries. Finding value in the materials that previously we were discarding is something that is pretty amazing. In fact, Marty and I had a good discussion on the fact that there is a tremendous movement afoot in the world for actually “mining” previously manufactured or processed materials for the core elements that have value. Not everything can be saved obviously, but unlocking the minerals, metals, and other substances is big business these days. When our sustainability committee identified recycling and trying to get to just 50% savings to landfill as our targeted goal for work this year for SGP (Sustainable Green Printing Partnership), we had a difficult time finding a recycling partner that made the work easy on our end. After all, we’re in the decorated apparel industry…not the move stuff around, and sift through trash industry. Building a recycling program is hard work, but finding a company that gives you tools, makes it easy and values customer service makes that chore a little easier. I’m very happy that we were able to start our sustainability journey and build a great relationship with a partner like Marty Oxman and Pioneer Industries. Without laws mandating that items are recyclable, this all becomes so complicated even to get to half of your stuff recycled. Interesting post, thanks for making all this effort to lead the way. Rick – no problem. It does get confusing fast, that’s why having a great partner that can answer your questions as they arise is so valuable. You just have to stop and listen and do the best you can. There’s always room for improvement. Great article Marshall. Should help demystify the process for a lot of people. How are the economics working out for you? You have less waste to landfill so you save money there, I assume. Do you earn anything from the recyclate you provide to Pioneer? Any thoughts on how you can help your clients move towards zero waste too? Can they send the boxes and polybags back to you? Our waste bill is down 1/3, and we get money back for the plastic polybag remnants and cardboard. We’re not doing this for the money though, as this will never be a profit center. We do have conversations with our customers and also our vendors regarding sustainability, and have leveraged the SGP certification into stronger relationships and more sales opportunities. Nice article Marshall! Thank you for making the time to share your field trip and insights with us. You exemplify how SGP certified printers (www.sgppartnership.org) are leading the industry with their passion and desire to share their experiences, inspiring others to learn and choose sustainability-driven business decisions too. Keep up the great work!